Thank you for reading our second installment of our advent series, please check out our advent page for more articles in this series. 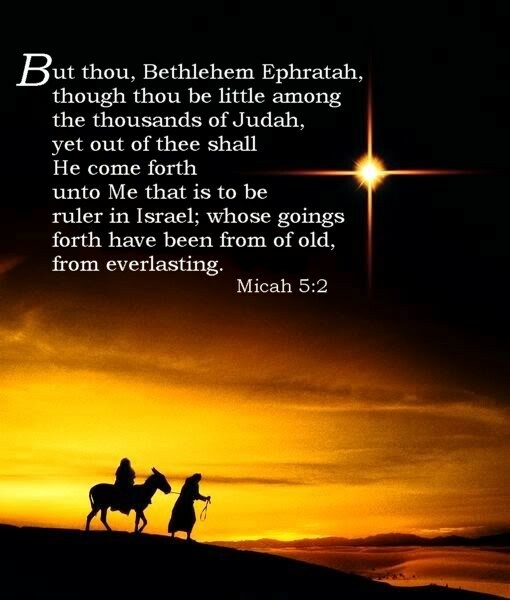 Micah 5:2 (ESV) But you, O Bethlehem Ephrathah, who are too little to be among the clans of Judah, from you shall come forth for me one who is to be ruler in Israel, whose coming forth is from of old, from ancient days. Thank you for reading day two of the TTE advent calendar, today we look at a verse which was often quoted in the time of Jesus being on this earth. Where was the messiah to be born? In yesterday’s article we looked at how the messiah was to be born of a woman, really, the skeptic among you may say “well that could apply to anyone” and that would be true. However passages in the bible really narrow it down to who is the messiah. They also point to the trustworthiness of the bible. Herod didn’t get the point of the messiah, he assumed that in the volatile political climate that he lived in that this Messiah would take away his limited power that he had. He already had to concede power to Rome and was essentially a puppet of Rome but he did not wish his power to be diluted any further by this religious messiah. We can learn from this, we get so involved in our lives and our problems that we fail to observe or notice the messiah. We resolve to fix our issues ourselves instead of allowing the one who takes our burdens to bear them for us. We are told Bethlehem, in the land of Judea was to be the place, what an honour for the place that was also the birthplace of David, the mighty King of Israel and a man after God’s own heart. Historically this was a period that the nation of Israel were not proud about, they were ruled by a foreign Roman power, they were ruled by an unjust king in an uneasy political balance where Jerusalem was a melting pot between Roman, Herodian and religious authority. So in these humble times, how fitting that God used a humble city, one that was not even regarded as much within it’s own borders to prophesy and deliver a messiah from. I see this in my life, that when I have been in the most humble of places, that is when God has used me and delivered abundance through me. This is where Herod got scared, he seen his power going away. Historically I find this laughable that he thought this way as the Messiah was known to be God. He could have taken out Herod with one word, however as we learn from the later part of Matthew 2, Herod was not going to last forever and he passed away while Jesus was in Egypt. What amazing humility to submit to those he had created. This truly blows my mind on so many levels. Jesus will rule, but when he comes back at the end of the world. The religious leaders thought they had snuffed out the problem when they coerced the Romans to crucify him. They did not want to face that he was God, but as Jesus proved at Calvary – YOU CAN’T KILL GOD! This part shows that he was not just a man, limited by a finite span on earth. He was there of old, he was there at the beginning, he was there at the end, and he was and is and is to come. This gives further credence to the fact that Jesus was there at the beginning of creation. This tells us that although Jesus was born in Bethlehem, the story did not start there. He is the ALPHA and OMEGA, the beginning and the end. (We read this is Revelation 22.) Being a third of the trinity he is as timeless as God. John 1:1 (ESV) In the beginning was the Word, and the Word was with God, and the Word was God. 2 He was in the beginning with God. 3 All things were made through him, and without him was not any thing made that was made. 4 In him was life, and the life was the light of men. 5 The light shines in the darkness, and the darkness has not overcome it. He was all of this and more, he was God, he had humanity, he had humility, he was perfect, he was sympathetic to man, he was love, we was sacrificial, he was glorious, he was the fulfillment of prophesy, he was the creator and he was and is and is to come the only way to heaven. He was all this and much, much more. He is my Savior and is the LORD. My hope is that this look at a messianic passage was a help to you and my hope is that this blessed you and hopefully stirred some questions about Jesus being your messiah.